I am not sure if someone has the same passion and interest in playing this nifty cute little introductory game, Dangerous Dave. I am talking about the first version of this game, where it features the side scrolling arcade action game with not much visual treats (it was one during those times). 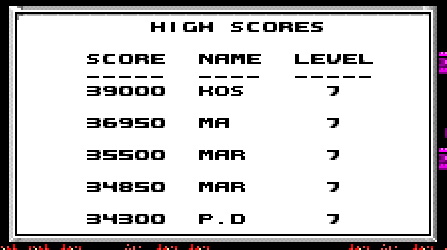 I was a crazy addict in my young ages and I had also tried to tamper with the high scores file and put my name to be the top. All you need is a simple hex editor. I believe even the SublimeText or vim does the work for you. They both have a hex mode to open the files in hexadecimal mode. We are going to change the results that gets displayed once a game is over. The old DOS games have an 8 + 3 naming convention. This 1989 game has three files in total. If we find the similarities between the score card and the hex we have got and map them accordingly, we can find that each record is in the following format. AA - Two byte digit level information (RAW). 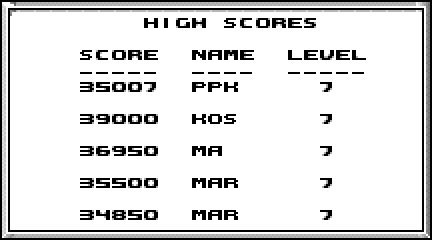 BB BBBB BBBB - Five byte digit score information (RAW). CCCC CC - Three byte character name (HEX).